The Amero is a hypothetical common currency that would replace the Mexican Peso and the U.S. and Canadian Dollar. The Amero would require some form of North American Union joining the economies of the U.S., Canada, and Mexico—a concept modeled after the Euro and the European Union. Academics have considered this possibility, but no serious proposal has ever been made by lawmakers in any of the three countries. Needless to say, the Amero is not traded in the interbank market. The Amero idea was suggested by Herbert Grubel, a professor of economics at the Fraser Institute. 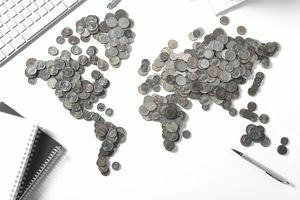 Grubel has proposed that a combined currency of the three nations would increase trade by reducing the complexity of trades involving more than a single currency and eliminating exchange rate risk. Grubel also noted that the Amero could reduce borrowing costs and eliminate wage arbitrage—the practice of hiring labor in another country with an unfavorable exchange rate in order to take advantage of the cheap later that results. Probably the biggest drawback of the Amero system is there is little enthusiasm for a common currency among voters in any of the three countries. Distaste for a common currency has grown with the well-known problems of the Euro, which have markedly increased unemployment and reduced capital formation in the weakest economic partners in the European Union. There is also a widespread belief among Americans in American Exceptionalism—a populist credo holding that among nations the U.S. is unique. But the Amero would require Americans to abandon the dollar in favor of a common currency, give up its right to conduct independent trade negotiations and require adherence to rules and regulations decided by a controlling body other than the U.S. Congress. Even among Europeans, this last requirement has proved onerous. In Great Britain, resentment over this last requirement has culminated in a move in early 2016 to exit the European Union entirely. The economies of the U.S., Canada, and Mexico are arguably even less alike than the majority of economies among members of the European Union. The United States Dollar is the primary reserve currency of the world, while the Mexican peso is seen as the currency of an emerging market. The diversity of these economies makes an Amero implausible. No, but conspiracy-oriented rumors of an Amero do. Claims that an Amero already exists were made in a 2007 blog post by Hal Turner, a white nationalist and Holocaust denier who has been convicted of making threats against federal judges. Few persons other than Turner's followers take this claim seriously. A photo of an Amero coin that Turner included in this post turned out to have been taken from online images of spoof coins designed by Daniel Carr. There is little chance in the current social, economic, and political environments that an Amero will be proposed, much less actually introduced. As for the future of the Amero, who can say? The idea of The United States of America—another melding of currencies, economies, and politics—was once considered a wildly unworkable and implausible idea.